Sometime life can become overwhelming and knowing what help is available and understanding what is best for your situation can be confusing in the midst of stress and anxiety. 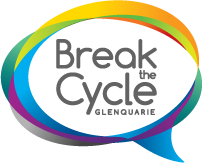 At Break the Cycle we are here to help you. There are a number of ways that Break the Cycle can help you move to where you would like to be. If you would like help with this please contact the office so we can arrange a time to chat to you about how we can help. We can be contacted on 02 9829 8898. If you are in danger or needing emergency help please 000.